Rated 5 out of 5 by Oahuwave007 from Dark Parables:The Red Riding Hood Sisters Collectors edition Extremely challenging and the graphics were so life like. Rated 5 out of 5 by nieakitty from Kitty's Thoughts: Red Ridding Warriors! Alright! I had to admit. I accidentally played this game first, and noticed that this was actually the fourth game. However, this game is still my number one Dark Parables to play.So, without further ado. Let's do the review: Storyline: The game starts off as the girl running away from this wolf in the woods. One of the red ridding hood sisters saved the girl, but got jacked in the back by the wolf queen. I won't spoil anything more than that because the game is best off played not said. Overall, your goal is to help the red ridding hood sisters. Level of Challenge: This game has a variety of difficulty which I like in most games. You start out your investigation easily. However, the closer you get the more difficult your findings and clues get. I will tell you the truth, the game is not hard. However, I am speaking from actually beating the game 5 times already on both editions. However, if you were a first time player like me who jumped into the game, you might find some previous game elements that you may never get unless you play the earlier parable versions. Fun Factor: I actually had a lot of fun playing this game. Especially, I like how you play in the day, but in your later investigations you had to play in the night. I wish they played more around with day and night or time. they played around with time in Final Cinderella. The mini games I find intriguing as well especially the ones that give you info about the story. Overall, this is a great game. I hope to play more dark parables series. This is an improvement from their earlier series. However, I strongly suggest playing the earlier series, since more past elements keep popping up in each version you play. Rated 5 out of 5 by Zeilies from Another Great Series Dark Parables: The Red Riding hood Sisters give the red riding hood fantasy children's story book a new meaning. Instead of the usual red riding hood we/most of us heard and loved this series gives the red riding hood girl more training, weapons or power to battle the evil with the big bad wolf as the base instead of the usual big bad wolf theme. The graphics/sound is fantastic. It's pretty challenging all throughout the story and it's fun to see some twist in the fantasy tale of red riding hood. It's worth it to buy as CE since the story itself will worth your time along with the game play. It's not easily to loose your way or give you frustration to the point of tears. Maybe I'm bias since I like this type of storyline something that base on fantasy. Since the creator of this series did a fantastic job in this game that made everything run smoothly by connecting all the right pieces together to make this story work without any problem. Rated 5 out of 5 by Wandakal1 from Can't go wrong with any of the Blue Tea Games Like all other Blue Tea Games the graphics are amazing and the storyline is very enjoyable. Rated 5 out of 5 by pookiewuv from ALL I CAN SAY IS W.A.G! All I can say is W.A.G! WOW WHAT A GAME! For 512MBs you get a stunning game with unbelievable graphics and a great storyline. The voice overs were great. The puzzles were not annoying and the Hint button refilled quickly. This game really held my attention. The makers of this game and all the other Dark Parable games really took their time and gave us a beautiful and excellent game. You guy along with BGF make a winning combo. You guys rock! Thanks. Rated 5 out of 5 by elenasstar from My new favorite game! This one had me at hello! The storyline was fabulous! Voice-over was stellar. (That's how I make my living) The graphics were stunning! It can't get any better than this one! Thank you, geniuses at Blue Tea, for hours of rivieting entertainment! Can't wait for the Cinderella story! WOW!!!!! Rated 5 out of 5 by medani from One of the best! I'm a huge fan of Dark Parables and often get on Bigfish just to see if the nest installment has been released. I was so excited to see the newest one when it came out and instantly downloaded it. I was hooked from the moment the game started. It's a definite buy for those who love fairytales. The game play is amazing and the graphics are always top notch. The puzzles really work your mind and make you think which is what I love. Such a great series. Rated 5 out of 5 by divinechild from Fairy Tales with a Different Ending. I loved this game and I love any of the Dark Parables that Blue Tea Games have done. I can't wait for the next one to show this upcoming May. Rated 5 out of 5 by katbeth01 from Fun game I have played and like all the games in the Dark Parables series. This game for me was not hard but not too easy either. Rated 5 out of 5 by Nscaler160 from Great Outstanding visuals and a great story. Rated 5 out of 5 by sapoe from great sequel! I really have fun this game from beginning 'til the end. I think as usual this game have a good sequel again! I never get bored! Also all of this series is one of my favorite games I ever played! So thank you blue tea, for making this beautiful yet great series! Good job and love it! Rated 5 out of 5 by piccolocv from Excellent Amazing game. I had a blast playing it. Good story, great graphics, hard puzzles...everything you look for in a game. Rated 5 out of 5 by 2lily from Loved it I love this game!!! But does the clip after the credits mean there is going to be another Dark Parable? Rated 5 out of 5 by Paige_Gabrielle from Excellent Game! As always, I urge people to buy the collector's edition. Yes, it's more expensive, but these games are VERY complex and you can get lost very quickly if you don't have the strategy guide on hand. Also, read the guide VERY carefully or you will miss things. It was an excellent game, very much what I expect for Blue Tea and Dark Parables. One of the things I love about Dark Parables is how all the games tie into each other, things from previous games show up in subsequent games. Do not buy the games out of sequence or you won't quite get what's going on sometimes. My only gripe is that I figured out the connection of the Wolf Queen and the Sisters very quickly, though it didn't ruin the game for me. The bonus content was fun and also worth paying $7 more. All in all, everything I've come to expect from Dark Parables and I can't wait for the next one. Rated 5 out of 5 by pomconfi from One of the best from Tea time Wonderful game. spent all Saturday "inside" of this fairytale literally. Played 3 times 18h in the row without sleep. couldn't stop. wanted to be involved in the story more and more and more... Much more fascinating then Briar Rose, Prince Frog, Snow white - the games from this producer. I would certainly suggest this game for someone who like girly games, fairy tales on new way, twisted, unusual... totally different world. Review: 1. Story is great - totally make it feel real, sounds made my heart go faster at nights... :-) . great created world. 2. graphics, voice overs all is wonderful. 3. apparently this game became one of my favourite few minuses: 1. Too much too much old fashioned HOGs and specially at the end... although you have to search among beautiful items not in the garbage :-) 2. Red Hood at the end of the day is a French girl... well... many of them looked way too hot and from Chinese anime :-))).... well.... well... 3, puzzles are only few in the game - greatly made. not too hard.... with too many too many old fashion HOGs so.... if you don't mind these and simply enjoy the story line and excitement of how story twists in new unexpected way - perfect game Additional game play is little boring.... anyway I suggest to buy the full version - 10 euros and so much joy... SO MUCH JOY!!!! Rated 5 out of 5 by rpggramma from Great Game! Dark Parables is always great. Very enjoyable. When playing "hard", you're on your own; no hints, no map, no info, which makes the game challenging! Different HOs; pieces are to be found, put together; become items that you really need to advance. Not sure whether this is a continuation, but the name of "Briar Rose" was mentioned. Seems as though another Parables will be coming. I definitely recommend! Rated 5 out of 5 by munshine from Loved it! Awesome, awesome, awesome. Great art too. Rated 5 out of 5 by BanditRedd from excellent ,excellent, excellent!!! the game was fantastic!!! storyline great!!!! You meet a character from the previous Dark Parables games as well as some statues from the past as well. Cant wait till they make another Dark Parables to add to my collection!!!! Recommend to purchase all the Dark Parables games. You will not be disappointed in any of there games!!!! Rated 5 out of 5 by roxwrites from Really enjoyed this gem of a game! The visuals, music and action are truly top notch. 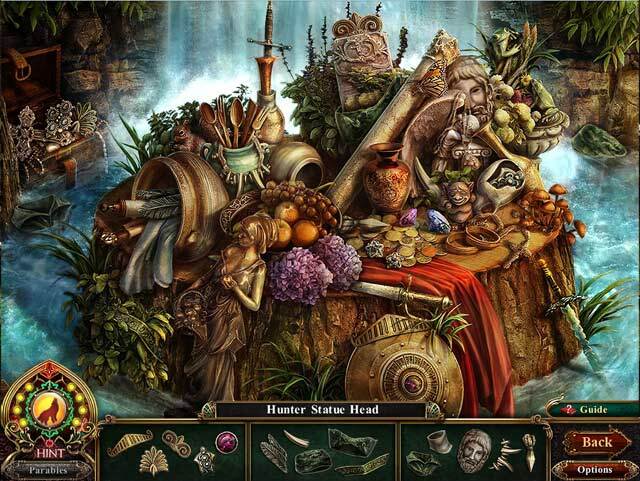 If I have a complaint it is that the hidden object scenes are too repetitive ... if there had been a little more variety in the types of scenes, rather than just "hunt pieces of this object", I'd have given it an unqualified thumbs up. Rated 5 out of 5 by PJSSLOTSWORLD from Red Riding Hood is my New Hero in this HO Adventure Game! ABSOLUTELY, POSITIVELY GET THIS GAME! 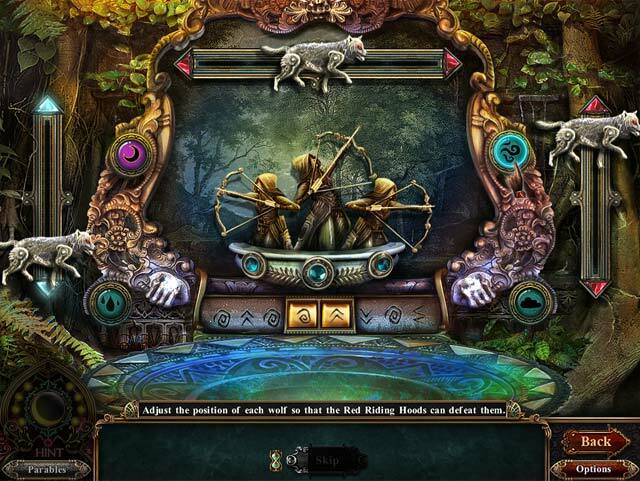 If you like Hidden Object Adventure Games, and Fairy Tale characters, (with a twist), you will love this game! The storyline is excellent! The graphics are amazingly well done. 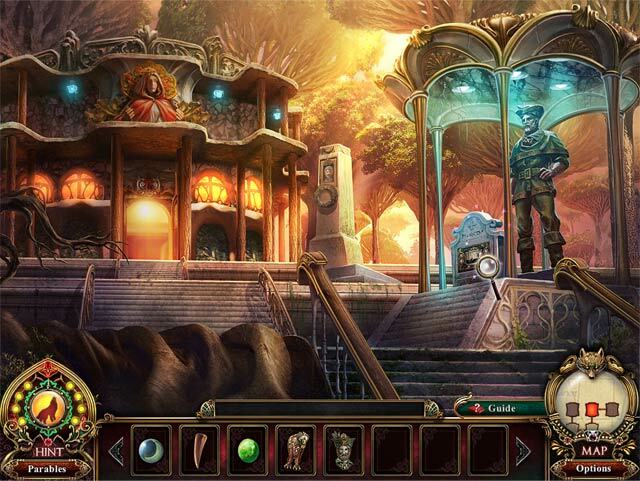 The hidden object scenes are challenging and fun. Once I started playing this game, I could not quit until I finished it. It is a lengthy game, as well. In the Collectors Edition of this game, there are also "morphing" objects to find; which really adds to the fun and excitement for me. After I purchased this game, I came back to BF and bought ALL of the Dark Parables games, and I am so glad that I did. This is a wonderful collection of games that I am certain to play over and over. There was NOTHING that I did not like about this game. I loved everything about it. I highly recommend this game...It's an adventure that will keep your interest, and challenges that will work your game-loving mind. YES...I RECOMMEND THIS GAME. Rated 5 out of 5 by Katiendan from Beautiful Graphics! 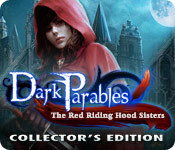 I really loved playing Dark Parables: The Red Riding Hood Sisters Collector's Edition! The graphics are amazing, the storyline interesting and original and it has HO scenes that have you find items to build various items that you will need as you progress in the game (which I like). Also, the collector's edition is definitely worth it! You get a different game that, in the end, ties in with the Red Riding Hood Sisters game - yet it isn't necessary to purchase the collector's edition in order to feel as if you finished the game. Overall, I would highly recommend this game to those who enjoy HO/adventure games. Rated 5 out of 5 by cathain3 from Blue Tea Games does it again... Let's get this out of the way: ALL BLUE TEA GAMES ARE FABULOUS. They are by far my favorite games. And this one is no exception. I got the CE (always worth it for Blue Tea Games) and finished the game in one fevered 3-4 hour session. The graphics, sound, gameplay, characters, story, etc... were all up to par and wonderful. I will be playing this game over and over again, along with all the other Blue Tea Games. It's worth the money. Don't hesitate. Buy it now!!! Rated 5 out of 5 by K_Mac8 from FINISHED REVIEW Really exciting finding out who the one red riding hood sister was, made me smile. I enjoyed the story and intrigue. Great puzzle games not too hard but not easy either. Really great game. Good Luck Fishes. Rated 5 out of 5 by LikaLaruku from Blue Tea learned from their mistakes. The previous Dark Parables games had lots of problems; the hidden objects were way too easy to find, they'd kept reusing the soundtrack from their first game over & over, the games were too short, the stories were like teen Disney fanfiction, it was too obvious what found objects went, the voice acting was terrible, the scripts were melodramatic, the animation was swimming through the Uncanny Valley (look it up), the hidden object scenes were too dark & required messing with the monitor or standing & leaning to see objects. Yeah, so this game is a massive improvement in the series. Has a good sized mini hog in it too that ties to the story, which I though had a far more interesting story than Frog Prince or Snow white. I'll take a Tom & Huck style adventure over fairy tale royalty any day, though storywise, Briar Rose was pretty good; didn't try to shove the story down your throat with cutscenes. I would recommend this game to anyone, but I only recommend the whople Dark Parables series to Disney or the Once Upon a Time TV series fans. Rated 5 out of 5 by hogamewhore from A Noteworthy Addition to Blue Tea Games' collection I thoroughly enjoyed this game, but I am going to argue that it is my favorite out of all of the Blue Tea Games hidden objects games that I have played thus far. There was a preview of it in Dark Parables: The Rise of the Snow Queen, its predecessor, so I was anticipating this game for a long time. I'm happy to share that it did not disappoint. Visual/Sound Quality: As with its predecessor, I found this game fun due to its immensely stunning visual/sound quality. The scenes are beautifully illustrated. Level of Challenge: The hidden objects scenes were a bit redundant, especially if you enjoy finding individual objects such as "a shoe," "a bag," or "a sun." As all BTG HOGs, you are looking for random pieces that create one object such as a shovel or a key. This can be a bit challenging because you are searching for smaller pieces such as a ribbon or a shard of glass. Because the graphics are high quality, there is little trouble with it. This is all personal preference, though. Storyline: The storyline of this game was the best out of all BTG HOGs, in my opinion. You are a given a small book and acquire objects to open mini stories, which help you understand the storyline as a whole. You learn more about the characters and what happened to them. These are things that are necessary to fuel the desire to continue playing. Without this feature, you would feel like you're simply shuffling through a HOG without any sort of goal in mind. This compensates for how long the game is and how much backtracking is involved in order to "win" or "get to the end." Conclusion: This game was fantastic. The Collector's Edition adds an additional mini HOG, which is just as high quality as the main game itself. Rated 5 out of 5 by DashGamesAddict from Just as good as the previous games Mystery Case Files used to be my favourite HOG series...not anymore. Dark Parables has taken its place. I have played every Dark Parable game. It's just awesome playing. Do yourself a favour and demo the game first. But I didn't even demo it, I bought it straight away.